In our series of letters from African journalists, novelist and writer Adaobi Tricia Nwaubani looks at how a teenager is transforming the lives of a city's street children. James Okina is quite open about his tearaway teenage days: Shoplifting; stealing from classmates; bunking off. "I was," he freely admits, "mixing with the wrong crowd." It is a shockingly candid confession - especially when you know that Okina, still just a teenager, is marking his third year heading a charity helping the scores of children who live on the streets of Calabar, capital of Cross River State, in southern Nigeria. It is a transformation he credits two people with: Firstly, a cousin, and secondly, a shabbily-clothed 13-year-old he met at a football match the year he finished secondary school. The boy's name was Frederick and he was one of hundreds of children trying to survive on their own in Calabar. Many come from the nearby camps which house people who fled their homes after Nigeria ceded their oil-rich land in Bakassi to neighbouring Cameroon, following a ruling by the International Court of Justice. Others have been labelled witches, and have been abandoned by their families - a common phenomenon in nearby Akwa Ibom state. But Frederick did, in fact, have a family: He shared a room with his mother. However, she had left eight months earlier, and he was fending for himself. "He looked tattered but I was surprised by how intelligent he sounded," Okina recalled. Like many street children, Frederick and his friend Kelvin survived by begging during the day. Then, in the evenings, the 13-year-old friends would perform acrobatics to entertain people in bars at night. Okina began visiting them daily, taking along snacks. "The bond we shared, it was really about the conversation we had but not about the food and the money," he said. "The more we talked, the more I felt a burden that I have to do more." But Okina did not have much. At the time, he was working in a fashion shop to earn some pocket money while waiting for university admission. His dream was to become an entrepreneur, to one day be known as a real estate mogul. 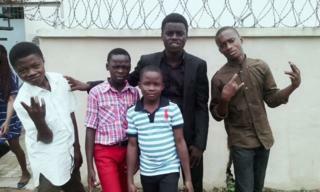 But he knew these boys needed help, so he approached Inyang Edem, a man in his church, who agreed to donate the fees and other requirements for Frederick's and Kelvin's education. "After I got these two kids back to school, I couldn't avoid it. I got myself more and more entangled," he said. Okina befriended some street children who hung out at a junction near his house, spending hours a day chatting with them. One day, as he turned to leave, a child grabbed his hand. Okina assumed the boy wanted to ask for money. "But, instead, he said: 'Uncle, please come back again'," Okina recalled. There and then, Okina made up his mind to do much more for the children. Knowing that having a structure would enable him to attract more support and to be better organised, he formed Street Priests Inc.
"In a time when people tend to hold the government or the clergy responsible for change in society, you can help with what you have from where you are. "Nobody has to ordain you. That's why we are called Street Priests," he explained. Using Facebook and his other networks, Okina sourced funds for the education of the next batch of 15 children. He continued visiting street children in other parts of Calabar and, in time, he became so popular among them that they would rush excitedly towards any bus or taxi when they spotted him inside, often making other passengers visibly uncomfortable. Three years later, now a business management student at the University of Calabar, 18-year-old Okina has crowdsourced funds for the education of 215 children, and he has a network of about 50 volunteers. "I do not intend to go looking for a job," he said. "But I will build my career around this cause." "His own comfortable life was turned upside down aged eight when his parents divorced." His determination is unsurprising, given the hardships Street Priests has allowed Okina to see up-close: Like the boy who was almost lynched for petty theft; another who lay comatose by the roadside for more than 24 hours after overdosing on drugs; and three who were simultaneously crushed to death by a falling electric pole. Then there was the boy who escaped from so-called "ritual killers", his face still baring the mark of the machete with which they had tried to stop him. "People say street children are hardened, but I say they are not - not yet," Okina said. "This is how street kids become hardened. They see their friends die. They say: 'The world doesn't care, so why should I?'" Okina knows what it is like to think no-one cares. His own comfortable life was turned upside down aged eight when his parents divorced. His mother moved out, but his father insisted on keeping Okina, the middle child, and his two brothers. Unhappy, he began spending more and more time outside their home, mixing with what he describes as "wrong friends". His grades crashed and he was constantly in trouble - not least for stealing. "I knew that I was not cut out for this life but there was nobody to take me out," he said. "Society is very quick to label people as bad or wrong. People are not looking for someone to tell them that what they are doing is wrong. They are looking for someone to take them out." But help for Okina was not far away: A cousin from Lagos inspired the young man. "He used to reach out to young people in high schools and barracks in Lagos with reading materials. I found that very inspiring," Okina said. "He was also very focused and knowledgeable." By listening to and speaking with his cousin, Okina gradually decided to change the path of his own life. He began taking his studies seriously and soon resumed his former place at the top of his class. "Many of the people who volunteer with Street Priests today are my former classmates who knew how bad my behaviour was and how radically I changed," he said. "They speak to the children about it and my story inspires hope in them." His mother also volunteers, offering free English lessons to the children. His father died last year. Street Priests has expanded its focus from facilitating access to education for street children to include those at risk of ending up in the street, such as those in displaced persons camps. The organisation's mission now includes advocating for the rights of children, educating the public on child rights, and creating a safe space for children. This last has proved the most challenging, as people are usually reluctant to hire out venues for events involving street children. "My plan is for us to get a place that we can call our own," he said. In December 2017, Street Priests held an event to show appreciation to outstanding volunteers and other benefactors. Edem, who gave Okina the money for Frederick's and Kelvin's fees, received a special award, and became so emotional that he shed tears. "At the time he gave me the money, he had no idea that he was starting something that would become what it is today," Okina said.